Here are some links for more info on buying, making or using a solar oven and even some full blown 3 course meals, cakes, cookies casseroles, recipes solarovens.org sunovens.org solarovens.net This next site provides plans for constructing solar ovens http://www.solarcooking.org/plans/. You may even come up with some cool new ways and materials. Some will work and some won’t, either way you can’t help but learn something. 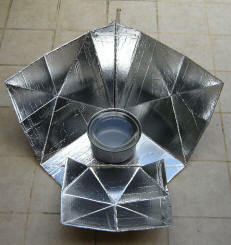 I can promise that every solar cooker you see is the result of someone thinking of a better way to do it. Who knows you may have an idea that no one has thought of yet. If you do come up with something better — Hey I would love to hear about it. For questions or to schedule a demonstration for your group here in the Central Valley contact: Marcia Alter 805-458-1241 or email address malter1101@alocom. And, of course you can see our attempt at making and cooking with a solar oven at holeinthefence.net Episode 6 Something Old, Something New and Something Entirely Different. Thank you Caroline you are very kind. Appreciate the suggestion about bookmarking. I hope to be able to put up a short video on how to make worm tea soon. It is very very easy to do and so beneficial to the garden. First I have to learn how to edit. I am way out of my element in that area. That was Samson’s forte. Yikes. I am trying….. Sorry for My English amuse, I am going to attempt to talk about hello, this web page is quite interesting and pleasant to understand. my business is a big fan from the subjects discussed. i also enjoy reading the comments, but discover that alot of folks ought to stay on topic to attempt and increase worth to the unique web page submit. i would also encourage everybody to bookmark this page for a favourite service to help multiply the term.